Having become one of the most important cultural centers, both national and international, Los Angeles imposes on us, Angelenos, certain pressures to keep up with the latest developments on its cultural front. For example, the Mike Kelley retrospective at the Geffen Contemporary and the Alexander Calder exhibition at LACMA both closed just a few days ago. Damn. I’ve seen these exhibitions several times, but it was not enough. And, my friends, if you missed these shows, I really am sorry for you. Auguste Rodin. Figures D’Ombres (Shadow Figures). On view at Los Angeles Municipal Art Gallery, July 17 – August 17, 2014. Courtesy LAMAG and Goupil Collection of the Musée Goupil, Bordeaux, France. Receiving a press release from Los Angeles Municipal Art Gallery about its current Auguste Rodin exhibition, including 127 prints and rare artifacts, I rushed over to Barnsdall Park to see this show (which runs through August 17th). The exhibition celebrates the 50th Anniversay of the Sister City relationship between Los Angeles and Bordeaux, France. This body of work by Rodin is known as Figures d’ombres, or, Shadow Figures, having been inspired by Dante’s Inferno. 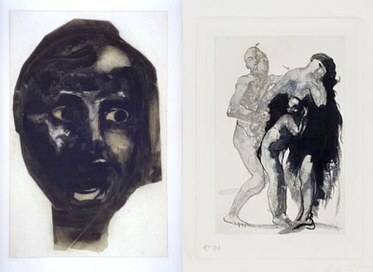 I had never seen these prints before, and was intrigued by this exhibition and, at the same time, frustrated. All labels were only in French. And though some of the prints bore handwritten notes by Rodin himself, no translations for these were provided either. It’s a pity that the organizers of this Rodin show chose not to collaborate with any of Los Angeles’ museums to help them make this exhibition more accessible, more public-friendly. 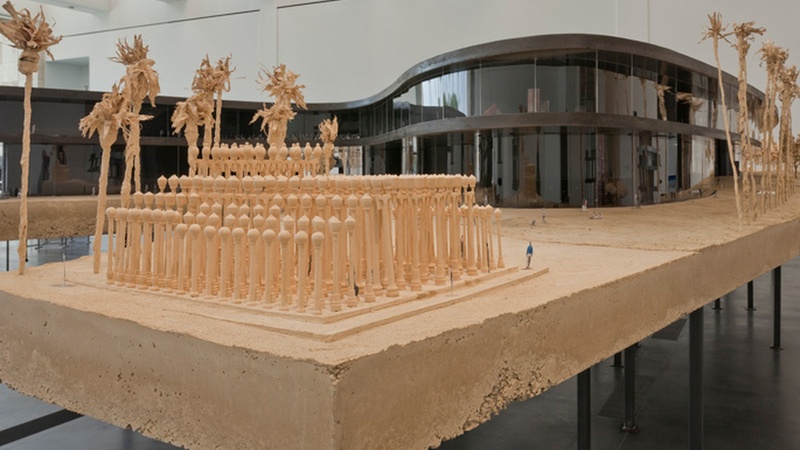 If you are an art aficionado, you are certainly aware of the latest development concerning LACMA’s redesign by renowned Swiss architect, Peter Zumthor. Under the pressure from the Page Museum to protect its vulnerable paleontological site, Zumthor’s new proposal shifts galleries across Wilshire Boulevard. To be completely honest, I was not much impressed with the original proposal, and even less so with the latest version. 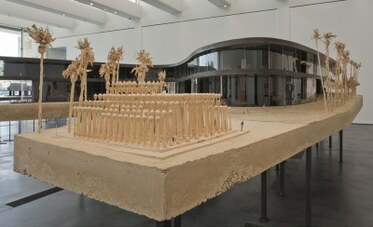 Zumthor LACMA proposal model, 2014. ©Atelier Peter Zumthor & Partner. Renowned architectural critic Joseph Giovannini, in his lengthy and eloquent essay –– just published by LA Review of Books –– claims, “To bridge or not to bridge is not a trivial question.” Giovannini pays respect to LACMA director Michael Govan as “one of the best informed, most charismatic museum directors in the country.” And though Giovannini also praises Zumthor’s small and medium-scale projects, he thinks that LACMA’s newly proposed 400,000-square-foot grand structure is of a scale beyond Zumthor’s comfort zone. 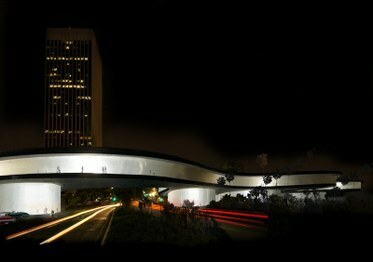 Zumthor LACMA proposal model, night shot, 2014. Defenders of the Swiss architect’s proposal claim that it is still preliminary. However, considering that the project has been in the works for more than 7 years, excusing its flaws because the project is still in preliminary stages is a bit of a stretch. I’m in agreement with Mr. Giovannini in his feeling that the interior plans of last year’s model were “vague and severely underdeveloped.” And, in my opinion, the way the collections were proposed to be shown in this new Zumthor superstructure made the art look overwhelmed, if not even imprisoned by the whole grand scheme. Bogart won for best actor in director John Huston’s film The African Queen, 1952 / Printed Later. Archival pigment print. Courtesy Robert Berman Gallery. (R) Murray Garrett. Marilyn Monroe at the premiere of There’s No Business Like Show Business, 1954 / Printed Later. (L) Murray Garrett. 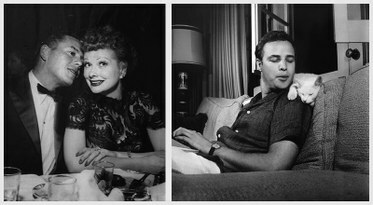 Lucille Ball and Desi Arnaz at a dinner party at the Ambassador Hotel, 1955. (R) Murray Garrett. Marlon Brando with Cat, 1954 / Printed Later. If you want to learn about Edward’s Fine Art of Art Collecting Classes, please visit his website. You can also read The New York Times article about his classes here.